This blog entry is really for beginners. If you are happy with what you are accomplishing just skip this entry. But otherwise if you are the person who reads the blogs, you might have some tools, but finds the road to furnitureville insurmountable, hopefully, this blog entry might be a little energizing. When I am not pondering and pontificating about tools, and I am usually trying to get 3 squares on the table for my family. In the past 4 years my cooking has been greatly influenced by the following two books and a website. Which gave me a great solution on how to get that great BBQ flavor in a NYC apartment. And a web site: www.vahrehvah.com. I not only learned how to cook Indian food I learned a basic casual attitude towards recipes that really liberated my cooking and cut down on the time I spent making stuff. His videos are great and really encouraging and he has the simplest, least expensive kitchen setup of any chef I have ever seen on TV. That being said finding the Cheater BBQ book made me want to make cheater pastrami - pastrami being one of my favorite foods and that was a fun adventure you can read about here. 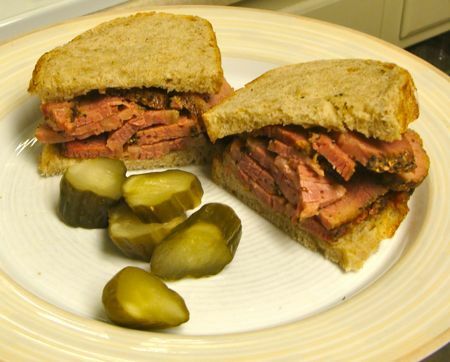 Now the impetus for writing this blog entry was the publication of my recipe for cheater pastrami but as I thought about this I realized that there is a woodworking lesson to learn from this. It's easy to be paralyzed by perfection. A lot of people feel that unless they have the perfect tool they can't do anything. Instead of working with what they have and practicing technique, they agonize and stay in a state of paralysis waiting until they have cut the perfect dovetail in a practice piece with the perfect saw; set up a dedicated sharpening center, and built the perfect shop. It's paralyzing and discouraging. Also I bet you get a lot of comments from your family about when you will finish anything. Everything else is frosting. Now I admit I'm part of the problem - I want to sell you the perfect dovetail saw or mortise chisel and now a veneer saw. Hey it's my job - I'm more to be pitied than judged. My tools will make making things easier, and as your work gets better, better tools make the job less frustrating and more productive. So yes you might want to buy some nice tools in the future. But for now don't let the lack of tools paralyze you. The trick when you are beginning is to figure out what you want to make, design the item to work within the range of what skills and tools you have and then go for it. The big secret of woodworking is that anyone, even rankest beginner, who manages to bring anything out of the workshop into the light of day is hailed as a craftsman by people who have never tried to make stuff. They won't see the flaws you see. They will complain about the color and the size, but they won't notice the gaps in joinery (especially after you fill them with wax). They will cheer you on to the next project. I promise. And practice will make it perfect. The way to learn to saw straight, the way to plane accurately, sharpen, and etc. is to practice it, and pay attention to what you are practicing so you learn from your mistakes. Complicated projects can be broken down into manageable pieces, and with each project, you will get better. Here's just one idea to get you making sawdust: The first project in The Joiner and Cabinetmaker is a nailed together packing crate. You don't need many tools to make it. It's only marginally useful when it's done, but if you are learning to use tools I can't imagine a better use of your time than cutting up and nailing together a box. Go for it. It's easier than you think and it will push you forward. Thanks for the Cheater BBQ plug, Joel. We too are avid fans of Artisan Bread in Five Minutes a Day and we pretty much stick to rye! Yes, I see the connection between furniture building and cooking. Throw out the perfectionism, get a few good tools, and get your hands dirty. You are so right...manageable bits. I'm going to have try this. Thanks! Joel, I could not have said it better myself! I teach woodworking classes and am amazed by the folks who think you need every tool before you start making something. I had a gentleman who owned several thousand dollars of Lie Nielsen tools, plus other first rate gear, and could not bring himself to use them to make furniture. He handed me his handplane and asked me to "use it." I did and it broke the ice for him and he is now on his way to making things. I tell other folks it is just a matter of getting your hands dirty. practice sawing, practice chiseling, practice drilling and pretty soon you will want to make something and your on your way. thanks for the great blogs! I always enjoy your thoughts and ideas! Excellent! Regardless of skill level we always come across a challenge that a better/newer tool would help us. (If we did not have these challenges then why bother!?!) Problem solving and a determination/willingness to do it quite often will do a good job. BTW, I agree on the coriander tip! PS - I will have to start following the Cheater site and pick up the Artisan Bread book... I'm responsible for the three squares in my house too! Awesome! I received the bread book you mentioned for xmas and am excited to try it. I am really psyched about the indian website. We love indian food but have not made it at home and also received some indian spices for xmas. Very timely. I also appreciate the advice about just building something. I am occasionally paralyzed by wanting to make things perfectly the first time and have been transitioning to hand tools. Excellent advice and post. Thanks a million. My husband tried to smoke pastrami on the grill once ... I'll have to point him to your recipe. Every night he cooks is more woodworking time for me. And I'd love to hear what your idea is of those "half dozen tools". I'm still in the "use the dining room table with a bench hook" stage of woodworking, so my curiousity has a reason. Finally, for other novice woodworkers, may I refer you to the "I Can Do That" projects over at the Popular Woodworking site? Some are kind of silly, but others are quite nice, teach real woodworking skills, and can be made with hand tools. It doesn't matter which 1/2 dozen tools you have - build what you have tools for. Don't buy tools until you actually need them for a specific task. Slowly a full shop will develop. If you read the the "Joiner and Cabinet Maker" you can see that the actual number of tools that are used for the projects are tiny. Even in a fully equipped shop - molding planes, and other less used tools belonged to the master and the journeymen and apprentices had very very few tools. As I continue to learn to use tools I find myself using fewer and fewer of them but the fewer I do use are used more skillfully and are working better than when I started. (I actually own pretty much everything ever invented) Where the fully stocked toolbox comes in is for specialized operations that one does infrequently. For the day in and day out work the actual toolkit is pretty small. I'm starting to write a bunch of how to blogs which specially try to avoid using lot of specialized tools and rely on practice to get good results. So stay tuned. I most certainly know about the "I can do that" series in pop wood - it's a great series. I have a huge library and I am still constantly learning new stuff on the web, in books, and in new sources that come to light (Although sometimes what I am learning is that not every NEW IDEA is a better idea). In addition to study the great partner in teaching is practice, and practice makes perfect. And remember to go out and look at as much great furniture in your area as you can find. Great article and I'm a decent example of it. That's not to say I don't salivate over the lovely new tools (specifically hand tools) that are adorning various sites/retailers, etc.) and money isn't getting any better so my poor old blue handles, and that #5 with half the jappaning gone will likely remain my babies for a while and I dont' have many complaints! I'm glad to hear I'm not the only one who finds similarities between cooking and woodworking. Maybe that's because I started working wood on the floor of my kitchen while in grad school. I eventually built a tiny bench that doubled as a kitchen island, and worked exclusively with a few hand tools and lumber from a nearby home center. My first projects were simple, perhaps even crude, but I learned a lot. I still do most of my woodworking by hand, when I'm not in the kitchen cooking dinner. Right on the mark! To all woodworkers-in-waiting: make something! The point is to make it so that it has meaning to you - however modest the project, however sparse your tool set, and however limited your skills. I am considering wood turning, and was browsing for info, when I came across your site. Not only am I intrigued by your pastrami, (I do have a smoker, but never thought of smoking corned beef) but was pleased with your mention of Artisan Bread in 5. I am currently baking through Healthy bread in 5, and Rye is our current project, which will post on the 15th. http://oldpopsblog.blogspot.com/ Connections are funny. I tried your cheater recipe on the weekend - ended up with cheater Montreal smoked meat! Sorry, I just couldn't resist. I have smoked corned beef on the grill and it takes babysitting all day. Your's still takes all day but no sitting and it is indoors. That makes a serious difference when the beer keeps freezing while you watch the grill. If you have one of those reciprocating electric knives (talk about unnecessary but for once useful tools), you can actually get thin slices of hot beef. Thanks for your referral of the cheater website. The two opposing forces are difficult to balance. The drive for perfection versus the drive to production. I've struggled cutting dovetails for the past several weeks, but have resigned to building a different project that, while still benefiting from the practice put in, won't have the dovetails front and center (or corner and corner as the case may be). A book that freed me to try many impossible cooking tasks is "Ratio: The simple codes behind everyday cooking" by Ruhlman. Best cookbook I ever got.